"You always offer chai. It doesn't matter what time of day it is or if it is 100° out." I don't remember exactly when I first started hearing about chai or when it became so ubiquitous but I did know that I initially did not enjoy it. There - I admitted it. However, my confession is not without reason. I want to say that the first time I had something "chai," it was astringent on my tongue, positively sharp and strong in aroma, and yet felt saturated in sugar. The scent of cinnamon was pervasive, and it just left a bad taste in my mouth overall. I'm not even sure where I first tasted it but it was not a pleasant first experience. Then I started working for the couture events company I did a few years ago which had a basis in Indian weddings and celebratory events. Chai was everywhere, and I fell in love with the taste. Cast off your thoughts of "chai tea lattes" and "pumpkin chai Frappaccinos." Real chai is extraordinary with strong cultural significance to boot. 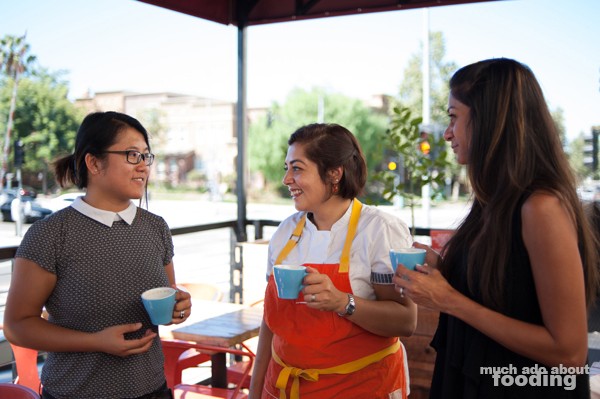 We were extremely excited for the unique opportunity to join Chef Shachi Mehra of ADYA in Anaheim back in her kitchen to learn how to make masala chai the way she serves and drinks it. In addition to getting a behind-the-scenes look into how the drink is made, we then became privy to just how important chai is to the Indian culture and heard Chef Shachi's many memories surrounding the soul- and heart-warming tea. 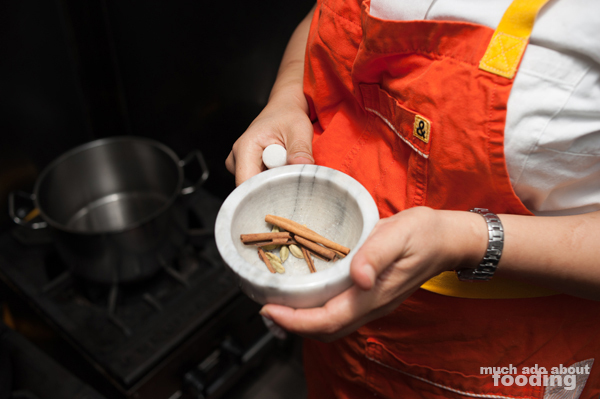 Masala Chai = "Spiced tea" = the milky tea drink with the spices people commonly associate with "chai"
Chef Shachi shared with us how education is a part of the training process at ADYA and that employees there have learned not to make this faux pas. Since they make five quarts of it at a time during the restaurant's open hours, they ought to know what to call it and what importance it holds for the Indian community. It's called masala chai or masala tea back there. 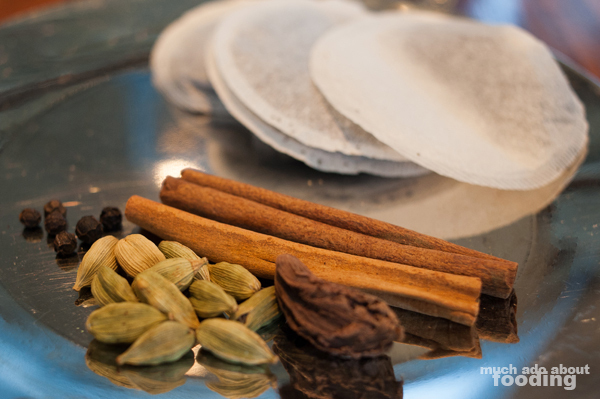 So what are the components that make masala chai what it is? Chef Shachi's version (recipe at bottom of post) is simply formed from cinnamon sticks, green cardamom, black cardamom, black peppercorns, ginger, water, milk, and black tea. There are multiple variations however. The masala (spices) used for chai relies heavily on cardamom but can also see appearances (or absences) of ginger, fennel, mint, holy basil, sugar, candied ginger, and sometimes green tea. Preference is key here. To start, Chef Shachi broke up the spices to open each pod for the infusion; these can easily be prepared ahead of time and stored away for a supply of chai-making ingredients. They are the first into the pot of water she had started. 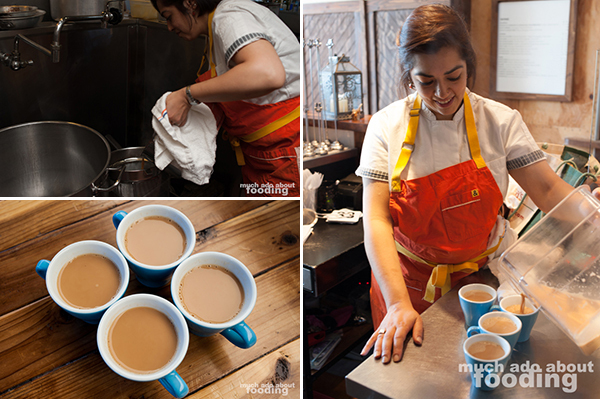 "Everyone is very particular about their chai because it's in their homes and in growing up." The point at which you add different components of chai is very important. It makes the tea yours and because chai is such a regular part of the culture's routine, it is noticeable when you change up the order. Do you put the milk in before the tea or the tea before the milk? Do you boil the milk or just let it barely bubble up? The ebullient chef told us that she'd be able to taste if someone did not boil their milk long enough with the black tea part. Another differentiating factor for chai drinkers and makers are the ingredients themselves and the quantities. Based on personal tastes, the components can also differ between time of day the chai is meant for. Many families have morning, afternoon, and evening chai times and change the ingredients depending on when the chai is meant for. One might add more healthful spices such as fennel and black pepper in the morning while using the afternoon chai as a pick-me-up (which, by the way, is always served with salty, spicy, and crunchy snacks). "The last time our extended family got together was on Thanksgiving a few years ago. There were about 20 of us with an age range from three months old to 78 years old. Whoever was up first had to make as much chai as could fit in the pot. The second shift to wake up had to make chai for the next and so forth. The making of chai in a house with lots of people never stops. There is always somebody wanting more chai - there is a lot of culture attached to it. Also, you graduate at different levels of chai. Your own process will change over time, what you put in it, and what you don't. My grandmother makes a different chai from my mother and mine is different from both of theirs." 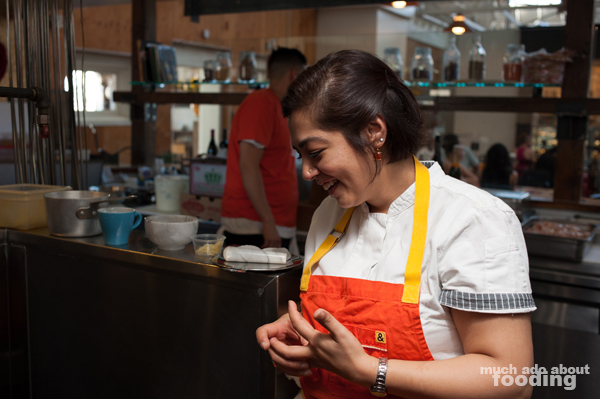 We did ask if her mother approved of her own version, and Chef Shachi nodded yes. That is a feat in itself as it seemed that everyone has their particular blends. "It's as if we have an addiction to chai. 5PM is chai time and it has to be really good or else it won't satisfy that craving. You might have had six cups but still not be satisfied." Now, we knew that chai was important to the Indian culture but we weren't aware of the frequency of consumption. Chai is everywhere from the banks in India (regardless of temperature outside) to celebratory events to office buildings ("Every office has a chai kid."). Chef Shachi shared with us how children would drink milky chai/chai milk/pink chai which was mostly milk with a splash of chai in it because they want what their parents are having. An uncle of hers would use chai instead of milk in cereal and dribbled a little bit of chai in his children's cereal milk as well. Relationships between two Indian people can run into chai arguments on who makes chai how and why. 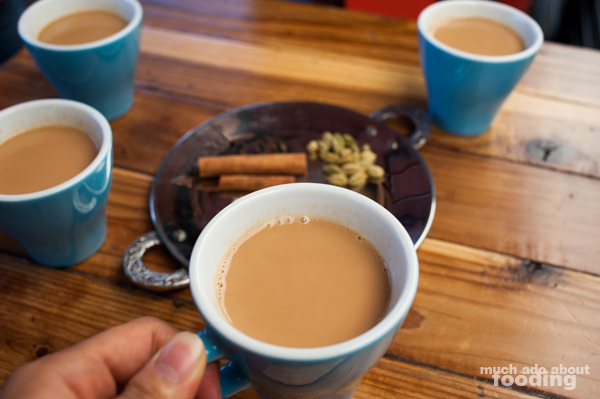 Tip: you must find out how your mother-in-law likes her chai and make it that way when she comes over! A poignant story she shared was her grandmother's experience trying to find chai in the US when it was not available anywhere. Instead, she ordered tea from McDonald's and poured cold milk over it as a makeshift chai which was nowhere near the authentic brewing. Now, we do see "chai" in plenty of drink and dish names but what is part of that? Often there is a lot of vanilla (not genuine), cinnamon overload, and sugar/syrup. 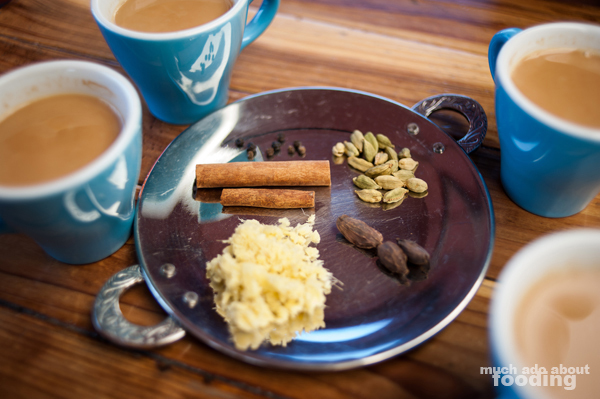 Where else can we find authentic chai in Orange County? 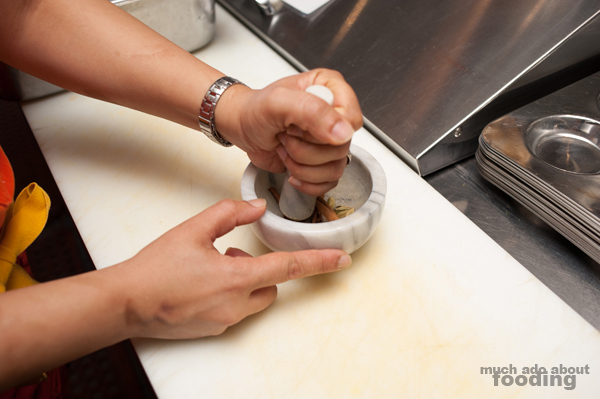 "Indian restaurants will do it the right way around here. Coffee places have their 'stuff' which has vanilla, cinnamon, and all the required things that are 'chai' or assumed to be chai. They're okay but they're not homemade chai. For me, I'll try a chai latte or chai but I will not drink it with this expectation - I'll drink it knowing it is a treat drink." 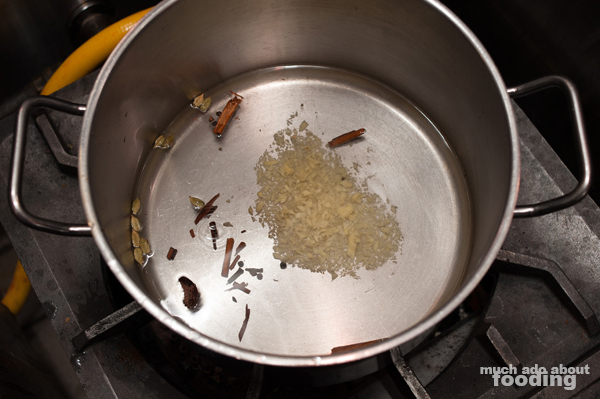 So after the masala is prepared, it is added along with the fresh ginger to a pot of water to bring to boil. The amount of water used is determined by the amount of cups you wish to drink. Chef Shachi used the cups we would be drinking from as a measurement, adding just a little extra for the loss during boiling. If everyone wanted sugar, this would be the time to add it as well (or you could do candied ginger). After boiling the masala, you would add milk next. In certain parts of India, the ratio of water to milk is 1:1 but Chef Shachi's own preference is less milk so we experienced it this way. Once the milk and water have begun boiling together, in go the tea bags. What tea do you use? "We use black tea. They also have masala-flavored tea bags in Indian supermarkets. I don't think it has enough flavor to not add more spice to it but it works if you don't have any masala at home." As we watched it boil, the color began to change and shift towards the more familiar chai color we knew and loved. The color is another main point of preference as some enjoy their chai stronger and some less. A creamy light brown is what came of Chef Shachi's version. Next step - straining..
Any words of advice for making chai? "Be careful with fresh ginger because it can cause your milk to curdle. Also, you'll want to let everything boil together for a few minutes before working with it. If it's in a smaller pot at home, you'll want for the bags to come up three times before straining." Is there something different from this preparation (aside from preferences) than from one made by someone in India still? "Chai cups in India are very small. Here we have such giant coffee cups which ends up being so many cups of chai. It makes a difference. Also, iced chai is not served there except maybe in most recent years, if at all. It is typically served hot and everywhere." Bring water, spices and ginger to boil together. Once boiled, add milk. Bring milk to a boil and simmer for three minutes. Add tea bags and reduce to low flame briefly. 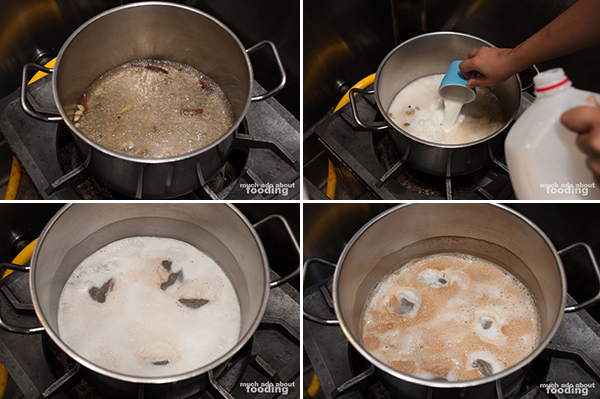 Return to boil and allow to simmer 5-6 minutes or until desired color is achieved. If you haven't heard about ADYA before, they are an amazing Indian restaurant located at the Anaheim Packing House at 440 S Anaheim Blvd #201, Anaheim, CA 92805. We've visited them plenty of times, including publishing some write-ups on their debut, a random follow-up visit, and their one-year anniversary. The restaurant was the recipient of the "Best Indian Food" honor at the 2015 Golden Food Awards and features an array of Indian classics and street food treats. You'll just have to stop in!